I'll try to provide you wth the most and accurate information as possible. Our page will be updated every week or possibly every day. If you have any comments or questions please send them to: MaryLizM@hotmail.com If you have any web pages to add to my page that concerns "Classic Tv" please send them to the email address above. 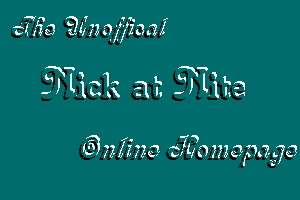 Click here, to visit Nick at Nite's tv schedules. Click here, to visit "Classic Tv" web pages.